"I did a combination of two recipes, peanut butter cookies with three ingredients and magic cookie bars. 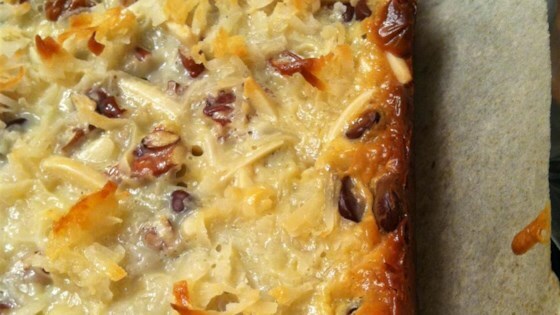 My brother-in-law loves magic cookie bars but is now gluten-free. I have been trying to come up with desserts for him so he doesn't feel left out. This is an amazing dessert and will stay fresh for days...if they last that long in your house! Perfect for Passover - no flour!" Preheat oven to 350 degrees F (175 degrees C). Line a 9x13-inch glass baking dish with parchment paper. Mix sugar and eggs together in a bowl until smooth; stir in peanut butter until well blended. Pour peanut butter mixture into the prepared baking dish. Bake in the preheated oven until cookie base is partly cooked, 8 minutes.